People switch to e-cigarettes for a variety of reasons. Some want to replace the experience of smoking with something that’s as close as possible without the combustion. Others want to reduce their nicotine intake, eventually using e-cigarettes with no nicotine. If you’re able to wean your body off of nicotine successfully, it is possible to simulate the experience of smoking using e-cigarettes with no nicotine and still have an extremely satisfying experience. Selecting the correct e-liquid is key because nicotine contributes flavor of its own and some e-liquids really don’t work without it. V2 Cigs is an example of a company that produces e-liquids at multiple nicotine levels — from 24 mg per ml to no nicotine at all — so you can step down at the rate of your choice. Better yet, V2 conducts extensive lab tests on its e-liquids that you can view yourself. Everything you love about the V2 Pro series -- and more. Use the coupon code VAPEGRL for a 10 percent discount. Aside from satisfying a smoker’s addition, nicotine contributes two things to an e-cigarette: flavor and throat hit. Although nicotine is extracted from tobacco, the nicotine used in e-cigarettes is typically about 99 percent pure. In other words, it tastes nothing like tobacco. Taste is a combination of flavor, smell and sensation, though; when nicotine is used in conjunction with the right flavors, the overall taste is definitely similar to tobacco. On its own, nicotine tastes slightly peppery. Throat hit is arguably the most important thing that nicotine contributes to e-cigarettes. This refers to the irritation that nicotine creates in the throat and lungs. It’s one of the key differences between e-cigarettes and other forms of nicotine supplementation. Lozenges, gums and patches don’t give you that same feeling of satisfaction, and I believe that’s one of the reasons why so many people fail when using those products to quit smoking. What Are E-Cigarettes With No Nicotine Like? When you use e-cigarettes with no nicotine, you lose the throat hit and the peppery complexity that nicotine brings to the flavor. With many e-liquids — particularly the mediocre Chinese e-liquids most companies sell — the resulting effect is slightly unpleasant. To make matters worse, the nicotine in many low-quality e-liquids covers disgusting chemical flavor notes. Those unpleasant flavors become evident when the nicotine is removed. Believe me, no one wants to taste chemicals. So, to have a satisfying, flavorful experience using e-cigarettes with no nicotine, you need to use e-liquids designed to taste good without it. These e-liquids should have rich, complex flavors. If possible, they should have an additive that replaces the missing throat hit. Three additives that create a similar feeling in the throat and lungs are menthol, grain alcohol and capsaicin. Grain alcohol adds little flavor to an e-liquid but creates a scratchy feeling in the throat. Capsaicin — the compound that makes chili peppers hot — creates a slight burn in the throat and lungs. Neither alcohol nor capsaicin creates exactly the same feeling as nicotine when inhaled, but they’re both definitely good nicotine-free alternatives. If you’d like to use e-cigarettes with no nicotine and don’t already have an e-cigarette kit, I suggest purchasing a kit from V2 Cigs as their quality control and warranty support are the best I’ve found in the industry to date. Use the coupon code vapegrl15 to save 15% on any purchase including a starter kit, or use the coupon code vapegrl to save 10% on all other purchases from V2 Cigs except V2 Pro. If you need a few alternatives for nicotine-free e-liquids, I suggest purchasing from Mad Hatter or Black Note. Mad Hatter produces e-liquids with some of the most intoxicating flavors you’ll find anywhere. Black Note exclusively makes e-liquids with natural tobacco extracts. If you live in Europe, V2 Cigs offers local shipping. In 2015, I reviewed an e-cigarette that’s actually designed from the ground up for those who would like to reduce their nicotine intake. This e-cigarette is the Wow Vapor V-Kit, which costs $69.99. The Wow Vapor V-Kit comes with a pre-filled cartridge that does include nicotine, but it also has a smaller vial of nicotine-free e-liquid in the same flavor. As you use the Wow Vapor e-cigarette, you can top the cartridge up with nicotine-free e-liquid and taper off your nicotine intake slowly. If you aren’t ready to completely eliminate nicotine when you’ve finished the first cartridge, that’s fine — every pre-filled cartridge or bottle of e-liquid purchased from Wow Vapor also includes another nicotine-free vial in the same flavor. Because the Wow Vapor e-cigarette has a five-volt battery, it produces a decent amount of throat hit even with nicotine-free e-liquid. The design is also simple enough to master even if you’ve never used an e-cigarette before. Some people look for nicotine-free e-cigarettes because they are primarily social smokers. You might enjoy lighting up at the bar or club on weekends, but otherwise you aren’t truly addicted to nicotine. If this is the case, a disposable hookah pen might be closer to what you’re looking for. Hookah pens contain no nicotine, feature flashy and colorful designs and come in a variety of fruity flavors. They generally last for about 800 puffs before beginning to lose their flavor. NEWhere is my favorite maker of hookah pens. They start at $9.99 each, and they’re available in several appealing flavors. 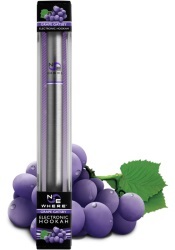 NEWhere hookah pens are e-cigarettes that contain no nicotine, and they’re about the same size as real cigarettes. I’m a Never Smoker. I’ve been cast in a play as A Smoker using a Vape that will result in an huge “smoke” exhale. Is there a No Flavor/oil No Nicotine liquid and Vape apparatus that will work? I have found the most realistic is the ePuffer disposables. You can get them with zero nicotine. You've decided to switch from smoking to e-smoking, but where do you begin? I recommend the best e-cigarette for beginners. If you're looking for a great tobacco e-liquid, there is nothing on the planet better than Black Note's all-tobacco lineup. Read my epic review! Performance? Style? Battery life? Liquid capacity? All of those qualities are important in an e-cigarette, but what about safety? If you want to know what the safest e-cigarette on the market is, I've got the answer -- and the statistics to back it up. To use a sub-ohm tank, you need a mod capable of handling a high-wattage load safely. I prefer the VaporFi VOX 60 TC. Find out why. With a flavor remarkably close to that of a real tobacco cigarette, the Vapor4Life disposable vape is easily the best disposable e-cigarette on the market. Read my review. What are mechanical mods, why might you want one, and what is the best mech mod on the market? Get all of the answers in this article. Having trouble tasting your e-liquid? You might have vape tongue! Learn about one of the most common vaping problems and find out how to cure it. A GameCube that enables simultaneous sub-ohm vaping for four people? 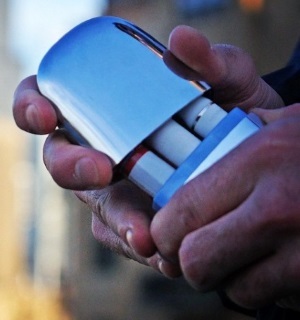 An Android-powered e-cigarette? A mechanical mod built into a replica of a Pac-Man arcade cabinet? I've found it all, and you can see these and other amazing items in my newly updated showcase of the world's craziest e-cigarettes! Hi, I'm Vapegrl and this is my e-cigarette review website. I started e-smoking four years ago to rid myself of a nasty tobacco habit, and since then I've tried just about every e-cigarette and e-liquid I could find in the never-ending search for the perfect vape. Now I'd like to pass on some of the things I've learned. I hope you enjoy my e-cigarette reviews and guide. Still looking for your first e-cigarette? Read about the best e-cigarette for beginners. I'd love to hear from you. Contact me! You can also join me on Facebook! Want to know more about me? Who is Vapegrl? Feel like sharing? Link to me! Why Are Some E-Cigarettes So Expensive? What are PG and VG? What is Nicotine Salt E-Liquid?